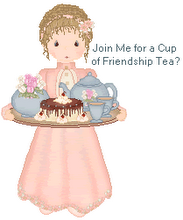 Friendship Tea: Horses or Hats? OK, I admit it! I am a "people watcher" and although the horses were magnificent on Wednesday, I took more photos at Churchill Downs of the hats! These hats are made by Anne Sawyer, the official Hat Designer for the Kentucky Derby Festival. The beautiful young lady in the two middle photos is Christina, Anne Sawyer's assistant. She sat at our table at lunch and gave us a little scoop on a celebrity to watch for on Saturday wearing one of their hats. Want a clue? think Dancing With the Stars... you'll have to watch TV on Saturday and see if you spot it! I have loved all of your Kentucky Derby posts. They have been interesting, informative, and a lot of fun to read. I love all of the pictures you have included. Thank you for sharing a tradition with us. Ooooh - If I had to choose between horses or hats, it would be so very tough! I grew up on a horse farm and I love hats! Fun, fun and so nice that we can have both. Hi - I've linked to you! Hats are so much fun! I enjoyed seeing the pictures of the pretty hats. Hi, Linda its Christina the lady who sat at your table during the lunch, love the pics glad to see I made your blog, it was lovely meeting you and your friends! Hope you all are doing well !